Bridging the Chasm Three - Madonna, Ashlee Simpson, John Eddie - Sauro Motel	• Sauro Motel - The Collected Writings of Bobby Sauro. I came home from my warehouse job one day in the summer of 1984 to find that, like her character in “Desperately Seeking Susan,” Madonna had busted into my creative house. One day, everything was in order and the next, she’s prancing around in my girlfriend’s sexiest, never-worn clothes. It was the “Borderline” video – number one every Friday that summer on video countdown show “HOT” – that provided the portal. It’s now 2009 and things have been kinda slow at my home-based, Y2K Compliance Company, so I’ve had some time to analyze it. 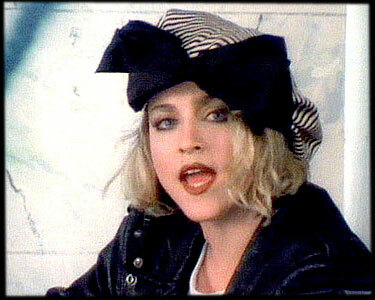 She did what she had to do because, in 1984, no one was ushering Madonna in through the front door. By the fall of 1984, I was working for a Wall Street law firm. Madonna sightings downtown were rampant, but the closest I got was the spiky-haired, paralegal co-worker who lived on the same block as the Hell’s Angels in Alphabet City, and was in Madonna’s aerobics class on 4th and Lafayette. On my recommendation, she was one of only four people to attend the private deposition of Nixon-era CIA Chief William Colby before she successfully escaped to a creative endeavor. On June 7, 1985, in the basement jukebox of a 30 Rock tavern, a mechanized, B-side crowd chants for Madonna to sing “Angel” while 2 blocks away, she hits the stage at Radio City for real, posing, preening, and promising to dress us up. Despite a record 3-day sellout (34 minutes), “The Daily News” is critical of her performance, based in part on her dropping her tambourine, and predicts that she will never fill a hockey arena. 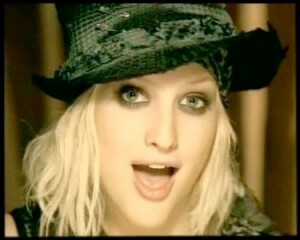 On October 3, 1984, Ashlee Simpson was born in Waco, Texas. In New York at the time, clubs and restaurants like Limelight, Odeon and Area were trendy, and McInerney was blowing up literary circles with Bolivian Marching Powder, in the second person. Why does Ashlee belong in an Affinity Trinity with Madonna and Wendy James? Well, if you’re like me and have given up on your eight year quest to figure out the plot to the movie “Vanilla Sky,” you have enough time to continue reading. For me, Wendy’s entry to the United States came via the video jukebox at a Penn Station, New York bar. Transvision Vamp’s “Tell That Girl to Shut Up” video was a potent weapon in the unofficial, bar room VJ brawl I had silently declared. No one will ever invite me to spin at LAX but I can put together a video jukebox set that will entertain even the most miserable train station bar crowd. Lost in the smoke at The Creature Cantina, I’d make the daring move of breaking the tenuous silence. Twelve monitors would come to life, capturing people’s attention in all sections of the bar. I usually sandwiched “Tell That Girl” between Jody Watley’s “Some Kind of Lover” and the red jock mastery of Cameo’s “Word Up.” The silver-studded, leather jacket, black ankle boots and red lingerie combo that Wendy sports in the video did the initial work, but it’s actually her eyes that stay fixed, even as she turns her body, that made the connection to the driven-to-the-brink-of-the-night crowd of Jersey commuters, undercover cops, and Hell’s Kitchen wannabees. Not even continuous coverage of the San Francisco earthquake could silence the pop-punk, torch-bearer of Strummer and Jones. Soon thereafter, Wendy reached the apex of the true barometer of fame; she was inundated with mail from men in prison. What interest would someone on death row have in her? It makes perfect sense to me because when you’re confined, you covet the freedom that’s been erased from the photographs but remains in your memory. Dubbed the tomboy kid sister of Goddess Jessica, Ashlee emerged with stains on her T-shirt and a punk-pop sound. Although she wanted out of the shadow, the immediate move into the spotlights had to be somewhat jarring. Given her sound and her Blonde Period looks, it’s not surprising that she, like Wendy before her, cited Debbie Harry as an influence. Ashlee missed The Clash and slam dancing the first time around, but not the criticism that dogged Madonna from the beginning and Wendy, as her star power rose. It’s the intensity of the criticism that really binds the Three. The Ashlee slams are so pervasive I don’t need to mention any, and you know what I’m talking about. For Ashlee, as it did for Wendy in the early 1990’s, the attacks became a deranged intruder trying to wreak havoc in her creative house. Instead of performing Blondie covers, though, Sauro Motel suggests Ashlee cover the contrarian anthem “Marchin’ On” by Welsh statement-makers The Alarm the next time she hits the road. Unlike in the video, though, faux military garb and Eastern Bloc, zombie-like crowd are optional. Like Frank Gorshin and his black and white opposite in that Star Trek television episode, the Manager of the Universe gets nervous if Madonna and Wendy are on the same continent, so, in the late 90’s, they established a New York-London axis, with Madonna moving to London and Wendy moving to New York to front her new band “Racine.” The transposition raised some eyebrows with the Mona Lisa mural on Broome Street, who previously thought she had seen everything, and was hoping for a convergence of the Three in NYC. “Borderline” or “L.O.V.E?” You tell me. Wendy is the most elusive of the Three. I still have my tickets from ’89 for TVamp’s NYC appearance at The Cat Club – I wound up working through the night thirty blocks away. I’ve never gotten over missing that show; it’s not unlike the disappointment I’ve felt watching George Peppard in “Breakfast at Tiffany’s” fifteen times and never hearing him say how he loves it when a plan comes together. A decade later, my luck was just as bad. A Racine show in NYC scheduled for the summer of 2006 was mysteriously canceled while I was en route from out of state, reminding me of my failed attempt in that same part of Manhattan to see Steven Soderbergh’s film “Kafka.” I spent the better part of an hour arguing with what I assumed was an ex-Bryn Mawr Debating Team Captain who had been shoe-horned into a ticket bubble. She denied the film was playing that evening although the title was clearly spelled out above her on the marquee. 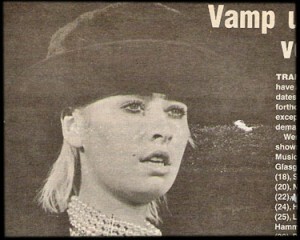 After Transvision Vamp broke up, Wendy released a solo album in 1991 called “Now Ain’t The Time For The Tears.” For all of M’s overt sexuality, it is Wendy who sings, “Now he’s getting fucked silly somewhere in Piccadilly” on the Elvis Costello-penned tune “London’s Brilliant.” No stranger to controversy, Wendy was chastised by various media outlets in the late 80’s/early 90’s for championing environmental causes and animal rights, for defending Chrissie Hynde, and, my personal favorite, for not representing “post-modernism” properly. Wendy and Ashlee generate strong opinions from fans and haters alike, but the opinions are really nothing more than theories. With wolves at your heels, the hardest thing to do is to move forward without looking back. As you may have guessed by now, once your creative house has been breached, you spend a lot of time looking for ways to fill the cracks. Ultimately, time passes, the cracks expand to chasms, and you realize they can’t be filled, because they were meant to be bridged. How will the bridge be built? In the meantime, it’s only fair that I disclose I have a fantasy involving the Three. To think it could happen is as senseless as the increasingly hostile argument I have been having with myself over whether Aja, The Firm, or Damn Yankees was the true 80’s Supergroup. It’s that Madonna, Wendy and Ashlee each take a verse on rocker John Eddie’s song “Tattoo” during an unannounced appearance at a small club I happen to stumble into; whether it be The Stone Pony or The Bitter End, on a brutal winter’s night, or Toby Keith’s Bar & Grill at Harrah’s in Vegas, tucked deep within the gaming labyrinth where small fortunes are won and loss. I don’t have any tattoos, but I’ve never been into literal meanings anyway.